Donating a pint of blood won't earn you any cash, but blood plasma pays. According to KATU News, blood plasma donations are up in Portland as folks look for ways to earn extra cash. Donors can give plasma twice a week, but the process takes a couple of hours (more if there's a long line at the blood bank). The process is not painful, and in addition to cash you get satisfaction of doing a good deed. Prepare your body to donate blood plasma by eating well and drinking plenty of water. BioLife Plasma Services recommends eating iron-rich lean foods, like lean red meat or eggs. Eat a healthy meal three or more hours before you donate. Call the five Portland blood banks from the list at the Blood Banker website to find out if they're currently paying for blood plasma donations. Ask about new donor requirements. For example. Biomat U.S.A. requires new donors live within 125 miles, possess a social security number and have a valid id. In October 2010, Talecris Plasma Resources, ZLB Plasma Service and Biomat U.S.A. pay for plasma donation. Head to the blood bank. 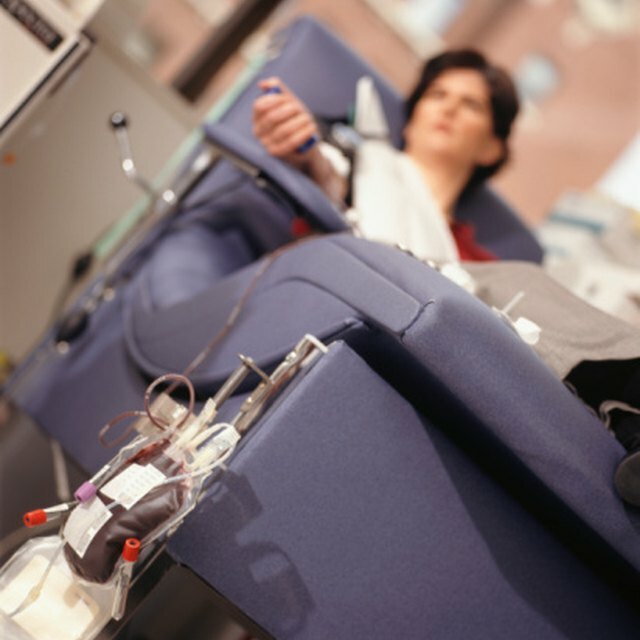 Plasma donation takes a few hours, especially since your first visit includes a medical screening. Check in at the front desk and fill out required paperwork with your personal information. Pass a basic medical screening, where you'll get your vital signs checked, get your iron level checked and give a short medical history. If you have enough iron in your blood to donate and aren't deemed risky, you'll have a more comprehensive medical examination before you can begin donating. Give blood plasma. A nurse will set you up for donation. Once you're finished, wait five minutes before rising since you may feel woozy. Stop at the reception desk to receive your cash. The amount of compensation varies and certain donors may be eligible for bonuses, according to Biomat U.S.A.
Donors should be 18 to 65 years old and at least 110 lbs., notes Biomat U.S.A.